A flexible business-focused router with excellent redundancy and VPN features. A high-end router that's user-friendly enough to suit smaller businesses, yet powerful enough to give excellent internet redundancy and handle large-scale networks spread across multiple locations. DrayTek’s new Vigor2926 is a business-focused and fiber-ready Wi-Fi router that packs in loads of advanced functionality. Key among those features is being able to keep the internet connected at all times, with dual Gigabit WAN ports and the ability to handle USB-based cellular connections if you want to BYO cellular modem (Mi-Fi routers). This is a device that’s primarily aimed at small to medium-sized businesses, and could be a good choice for companies who think they might need room to grow in the future. It’s also potentially suitable for home users with more specific needs — in particular, those who have a larger cryptocurrency mining setup and need a 3G/4G failover connection to avoid any possible downtime. Rather than a single spec, the Vigor2926 series comes in a number of different models. The Vigor2926ac ditches the VoIP and costs $399/£262/AU$500, while the lower spec Wireless-N 2926n model is $300/£210/AU$420. There’s also a plain 2926 with no Wi-Fi at all: that’s just $206/£199/AU$369. Of those several different Vigor2926’s on offer, we tested the top-tier model for this review, which has 4x4 MU-MIMO 802.11ac spec Wi-Fi, able to deliver speeds up to 1,733Mbps. It also has dual WAN ports, two USB 2.0 connections, as well as four Gigabit LAN ports and VoIP functionality. Dual USB 2.0 means you can add two cellular modems, or connect multiple storage devices. The router itself is also rack-mountable to fit in your server room and can even be equipped to monitor the temperature of other equipment via an optional USB probe. Most businesses these days can’t afford any internet downtime, and the Vigor2926 attempts to deal with that via a big focus on redundancy and connection duplication. For a start, the dual Gigabit WAN ports can combine two fixed connections into one, with built-in load balancing or failover. As a further backup option, it can also handle two cellular modems via USB in case your main internet line (or lines) goes down. While that’ll be overkill for many users, it’s a versatile featureset for those who need top notch redundancy. For a very small business, the Vigor2926 might provide enough features to deliver everything you need, networking-wise, but it's perhaps even better-suited for companies with a network with many devices to manage. With four LAN ports total, however, it’s primarily intended to be the central hub between other devices, rather than connecting directly to users’ computers – it’s designed to sit in the middle of a business network that consists of switches, wireless access points, and perhaps even other routers. To help make life easier for the IT staff, the Vigor2926 can remotely monitor and manage your network from a built-in console that's accessible via a web browser. Of course, it can only provide detailed monitoring for other DrayTek devices, so it’ll work best when integrated as part of a new network setup, rather than being added onto an existing one. The router can happily handle a growing or quite large business though, with the ability to manage up to 20 DrayTek wireless access points and 10 Vigor network switches. DrayTek also includes Smart Monitor – a free network traffic analyser which can help troubleshoot any issues. With many companies increasingly spread out, physically, they often have people working from home or in different office locations. The Vigor2926 helps keep everyone connected yet secure, with a built-in firewall that can filter web content, restrict access to certain types of traffic (like P2P) and block many other online risks. It can also help divide and manage your network, with support for up to eight LAN IP subnets, which can be assigned to a further 16 virtual LANs. The 2926 is equipped to handle remote workers’ VPN needs too, with up to 50 VPN tunnels. The Vigor2926's status lights are about as straightforward as they come: no confusing icons, just clear, plain text and a status LED to tell you if anything's not working as desired. DrayTek has a solid reputation when it comes to the quality of its hardware hardware, and more recently, it’s been working hard to shake off some of the interface impenetrability — and that shows with the Vigor2926Vac, which is a little more beginner-friendly than some of its previous products. That said, it certainly still focuses function over form, and the interface is not as slick or showy as what many home routers now offer. For anyone who wants to poke around in that interface before committing, DrayTek has an online demo of the 2926 where you can take a look through all its ins and outs at http://eu.draytek.com:12926. This is a great way to get a feel for the router and its features. The Vigor2926 uses a standard web browser interface for access, and at first glance, the layout should look fairly familiar to anyone that’s configured a router before. The main dashboard gets across all the pertinent information, and has a quick access tab for key features. As you delve in deeper though, it quickly becomes apparent just how many sub options there are. That’s not a bad thing, as it gives the option for very detailed control over your network and means it can suit quite complex and varied business needs. Everything’s very clearly labelled, but for those unfamiliar with many of the features, it can still look a little daunting. To help ease the transition for complex options such as setting up VPNs or even just configuring the Wi-Fi, the router does include a range of Wizards. These still tend to feel like they are at more of an intermediate level though, so the real help comes from the excellent support pages on the DrayTek website. The latter starts off with basic guides to getting started and improving security, and has articles all the way through to covering specific complex features. The support page also has a search function, as well as further email support if you’re truly stuck. When setting up the internet connectivity redundancy using the aforementioned dual-WAN and dual-cellular connections, the interface options do initially look a touch bare... until you realise that clicking each WAN option in the index takes you through to the deeper settings, which are actually very easy to use. While everything can be set to just provide load balancing across the various internet connections you’ve got set up, the true flexibility is in the in depth failover options. For example, your business might have a single WAN internet connection, alongside a USB cellular modem as a backup. It can be configured so if the WAN disconnects, the cellular connection immediately kicks in. But you can also specify that if the WAN traffic reaches a certain threshold, the cellular connection is then added into the mix to provide extra bandwidth. It’s even possible to connect a second 2926 router to the network that's configured as a redundant backup device, and which will take over if the main router ever experiences problems. All the Vigor2926's important hardware features are on the front for easier access – the rear is just for plugging in power and, depending on the specific model, attaching the Wi-Fi antennas. The Vigor2926 has loads of configuration options in the management console, but once you get it up and running with other devices, it can actually be used for performing maintenance tasks on other DrayTek devices on the network, such as firmware upgrades, config backups and restores, as well as ongoing monitoring. As we mentioned earlier, the Vigor2926 is well-equipped to handle businesses spread across multiple sites – whether that’s just different floors in the same building, or entire offices in different states or countries. Jumping into the LAN settings, you can set up to eigh IP subnets, and create up to 16 virtual LANs. It looks a little complex, but the configuration page does make it simple to configure your wider network – albeit, as long as you vaguely know what you are doing. At a basic level, this capability can also allow a business to separate out different departments or users into their own LANs without needing extra physical hardware. The benefits include better network control, security, performance, and potentially reduced cabling. For non-local connections, the router can handle up to 50 VPN tunnels, allowing the creation of secure links to offsite networks. For example, these could be used to connect to branch offices, suppliers, or allow employers to connect remotely when working from home, or out in the field. While the actual options and layout (including the aforementioned Wizards) for setting up VPNs are nice and logical, actually knowing which settings are needed will still require some higher-end networking know-how. It’s easy to be overwhelmed by the depth of options available in the Vigor2926, but the steps needed to navigate the interface and features are fairly logical and intuitive. And just as importantly, there are plenty of options available for support in understanding and setting up the router. The Vigor2926's sophisticated interface lets you configure and monitor your network in great detail. For this review, we conducted extensive testing with the top-end model, the Vigor2926Vac. 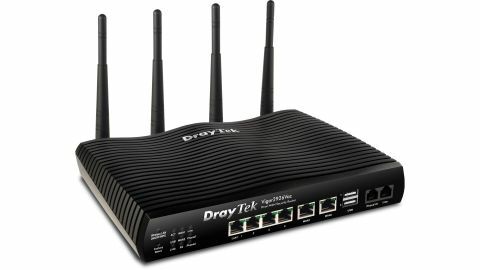 For core management and VPN features, that included setting up remote connections with a DrayTek Vigor2860Ln. We tested the wireless network using a Netgear A6200 USB Wi-Fi dongle, rated for 867Mbps on the 5GHz band. Keep in mind that ultimate wireless speeds you're able to achieve will depend on the device and antennas used. For the latter wireless tests, we managed a typical but not outstanding throughput of 612Mpbs at a distance of 1 metre. At 10 metres, that speed dropped off to 336Mbps. That’s not a particularly surprising or concerning result, as the 2926 is really designed to link into a range of wireless access points, rather than get the maximum range itself. The 2926Vac had no problem opening and maintaining stable VPN connections during our tests, or using its failover and load balancing features to maintain and manage (respectively) an internet connection. While the Vigor2926 does everything it says on the box without complaint, it’s an advanced device so it’s worth making sure you need its specific featureset. Keep in mind, as well, that while the router is relatively easy to use, the in-depth functionality does gets complex and requires some networking knowledge to use. If it meets your requirements (and you meet its!) however, the Vigor2926 is an excellent option for a small to medium business that wants a smart, flexible network upgrade.